Denise Young is a wife, mother, daughter and nurse, and firmly believes a fifth title – runner – makes her better in all her other roles. Like many working women, Denise juggles a job she loves – she’s a nurse in Akron Children’s GOJO Outpatient Surgery Center – with a family she cherishes. She is married to Matt, a high school principal, and is mother to Matthew, 15, and Nick, 13. No matter how busy she is, she finds time for running. If it means waking up extra early or hopping on the treadmill after a long day, she makes time. Although Denise didn’t run in high school or college, she has become a very competitive runner, entering dozens of races per year, qualifying for the Boston Marathon, and always striving to improve her personal record (PR) in everything from the 5k to the marathon. But it’s a passion that has evolved. “I understood exactly that saying that runners print on their shirts: ‘Our sport is your sport’s punishment,” she said with a laugh. But then she started dating Matt, a former track and field athlete at Kent State University who went on to coach cross country and track at Copley High School for many years. Matt’s enthusiasm for running was infectious. 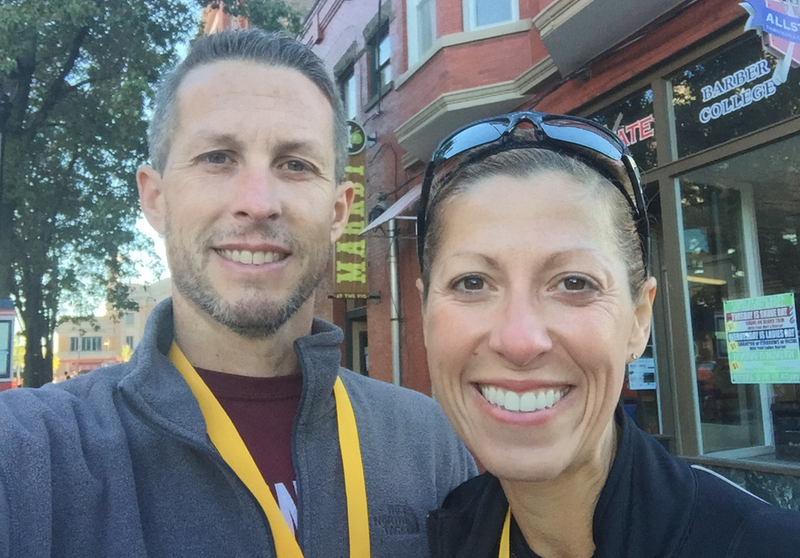 Then a nurse in the NICU, Denise got more running inspiration from a co-worker and mom who had just had twins but barely let pregnancy and birth sidetrack her running. Denise worked the 7 p.m. to 7 a.m. shift but created a routine of weekday treadmill workouts and weekend long runs. Her first race was Akron Children’s Kids are Number One Run in 2001. 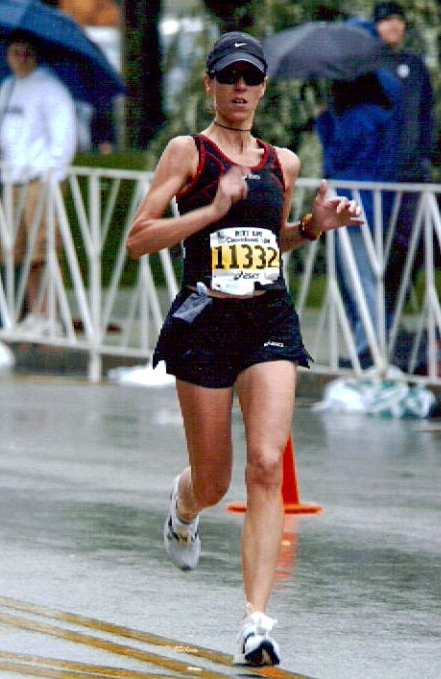 From there, she set her sights on the inaugural Akron Marathon in 2003. “It was painful, but I survived,” she said. Ten years ago, Denise became committed to running better and faster. She consulted with an exercise physiologist, who performed tests of her aerobic and lactic acid threshold and maximum heart rate to develop training plans. Learning the science behind running – devoting workouts to long runs or quality speed work, for example – led to several years of PRs, including her 19:31 5k in the Medina Twin Sizzler in 2009. 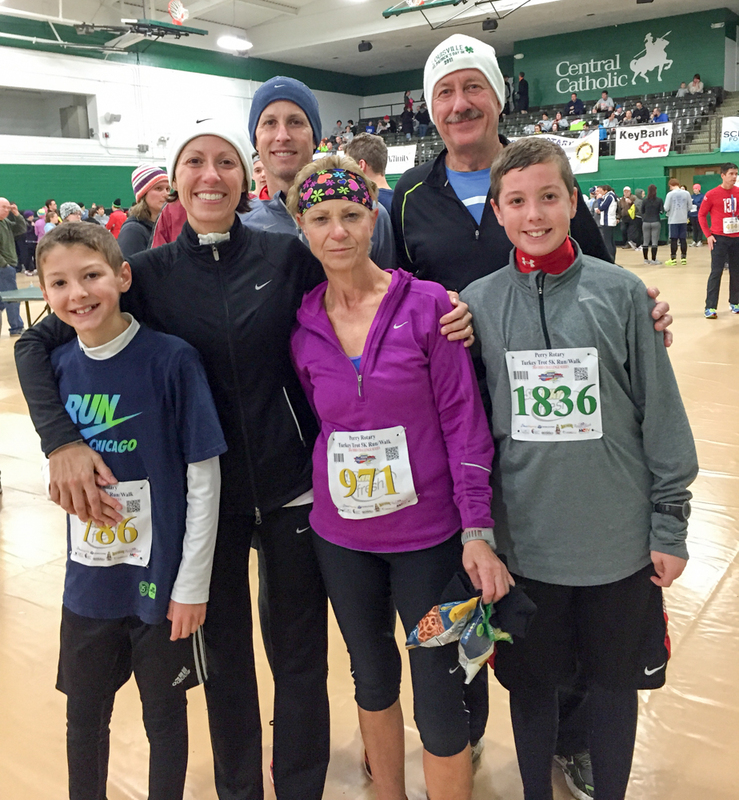 Even more than the joy of winning a race or setting a new PR, Denise loves what running has come to mean to her family. In 2008, Matt qualified for the Boston Marathon and Denise and the boys cheered him on. The trip included a trolly tour of the city, a visit to the aquarium and just taking in all the excitement of marathon weekend. Later that fall, Matt and the boys cheered Denise on at the Columbus Marathon, where she ran a PR of 3:26. 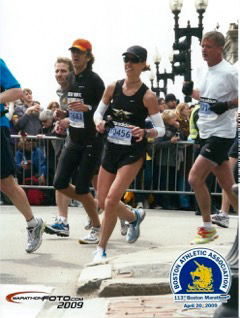 She then qualified for Boston in 2009 and Matt ran Boston again in 2010. “That 2010 trip to Boston was special because my mom and dad [Angela and Paul Bosela] came with us and ran their first 5k,” said Denise. Denise has also run the Chicago and Cleveland Marathons and plans to run all 3 events in the Akron Children’s Hospital Akron Marathon Race Series this year. And these days, Denise and Matt are equally busy cheering Matthew and Nick on at their cross country and track meets and soccer games. For more information on the 2016 Akron Children’s Hospital Akron Marathon Race Series, visit www.akronmarathon.org. This story is part of a series called A Mile in My Shoes that features Akron Children’s Hospital employees who are participating in the Akron Marathon Race Series.